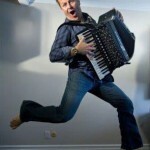 Accordions are cool. Come join us for the last of the warm weather and evening twilight while listening to the soft sounds of Jeffery Iacano and enjoying Stephan’s harvest cuisine with a glass of wine at the Bedford Tasting Room Courtyard. $15, $10 for wine club members. You are currently browsing the Bedford Winery blog archives for September, 2015.